2012. An average movie, and, according to some interpretations of an ancient Maya calendar, Mother Earth’s final year. With this in mind, UCT’s Green Campus Initiative (GCI) has decided to bring its annual Green Week – suitably themed Because the World Ends This Year – forward to the first semester. 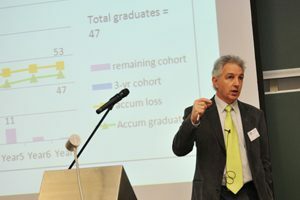 The road ahead: There’s plenty of work to be done to improve throughput rates, said VC Dr Max Price. UCT’s reputation may be built on its research muscle, but those attending the Conference on Teaching and Learning @ UCT on 11 November were making a strong case for beefing up the university’s teaching credentials as well. The Green Campus Initiative (GCI) has proven itself to be an industrious and committed group of environmentally concerned students; and not just during campus times, mind you. Three GCI members will attend – as official UCT delegates – the 17th Conference of the Parties to the United Nations Framework Convention on Climate Change, or COP17, starting in Durban at the end of November. Hub of expertise: (From left) Profs Bruce Hewitson, Mark New and Harald Winkler address the media. 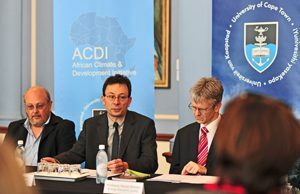 Just hours prior to the arrival of the Prince of Wales at UCT on Saturday 5 November, the university formally introduced its new African Climate and Development Initiative (ACDI) and its director and pro vice-chancellor for climate change, Professor Mark New, to the media. The ACDI is envisioned as a “multi-disciplinary, cross-university research, teaching and outreach programme that will address the challenges that climate change presents for Africa’s economic, political, social and natural environment”, New explained. 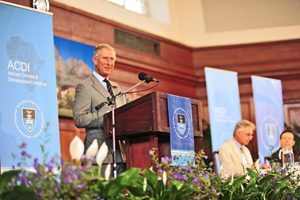 Looking ahead: The Prince of Wales spoke just hours after UCT had formally unveiled its new African Climate and Development Initiative (ACDI), which aims to harness university and (ultimately) continental expertise to address issues of climate change and sustainable development. Far right, next to VC Dr Max Price, sits Dr Max Price, the university’s first Pro Vice-Chancellor for Climate Change. The birth of the world’s seven-billionth resident, marked symbolically on 31 October, offered a timely backdrop to the talk by the Prince of Wales at UCT earlier today, 5 November. From installing meters and retrofitting lights, to conserving certain areas and incorporating ‘green star’ features into buildings, UCT is making significant strides in creating an environmentally friendly institution. The green star rating is a tool developed by the Green Building Council of South Africa, based on the Australian Green Building Council tools, to provide the property industry with an objective measurement for green buildings. It also recognises and rewards environmental leadership. 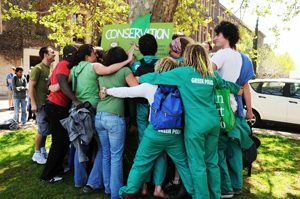 Part of the Green Campus Initiative (GCI), Green Week kicks off at UCT on 3 October and heralds a full programme of events on campus. 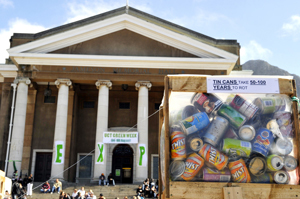 To mark the week, Monday Paper has gone green, and so, too, has UCT’s website. During Green Week, the GCI will promote a couple of new projects, testimony that the five-year student-driven initiative is growing bigger – and better. Among these the Consumer Activism project, which teaches students and staff to be ‘consumer conscious’ by buying products that promote sustainability, and to know their rights as consumers. Joining forces: GCI members who attended the Bluebuck summit were (from left) Richard Parker, Rivonia Pillay, Sam Lee Pan, Rirhandzu Marivate, Kate Pallett, Andrew McNaught, Dane Rossenrode and Nicolas Wiid. 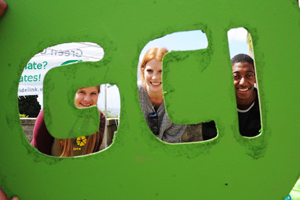 UCT’s Green Campus Initiative (GCI) was a major player in the new BlueBuck Network’s first summit held at Rhodes University during the winter vacation. 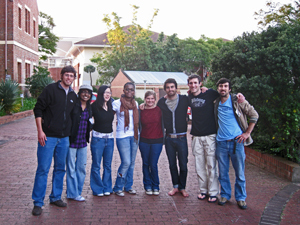 Established with the University of Stellenbosch’s EcoMaties and Rhodes University’s South East African Climate Consortium Student Forum, BlueBuck met to discuss future plans, and the forthcoming 17th annual United Nations Framework Convention on Climate Change to be held in Durban in December. Switched on: Katherine Thomson of the Faculty of Science, Chris Barnett (SCRU), Adiel Hattes of the Leadership College, Dr Karl Wilkinson (SCRU) and Ian Rogers (SCRU) at the handover of computers. When UCT’s Scientific Computing Research Unit (SCRU) – which applies its vast computing platform to research in computational biology, physics, chemistry and biophysics – moved into state-of-the-art modern facilities recently, it chose not to decommission its old and unused computer equipment.